You know how painful it can be to have a weak tooth within your smile. Imagine tons of sensitivity and uneasiness every time you try to simply enjoy your food. It’s not fun. What’s even worse is waiting days—even weeks at a time—for a dental crown to help re-stabilize your tooth. Luckily, your dentist in Waco has invested into Premier Family Dental with advanced CEREC technology. Our innovative office puts pain relief, convenience, and comfort of our patients as our first priorities. We’re able to show this by offering these revolutionary services. Since this is a new, modern part of dentistry, you may have some questions. We’re happy to address them for you. Can CEREC technology really create a dental crown in one visit? Believe it or not, the term “same day” dental crown is actually very accurate. We can complete the whole process of forming your custom dental crown in our office. It takes just about an hour from beginning to end. Dr. Cofer was able to eliminate the need for those messy, uncomfortable impression materials. Our patients also don’t have to wear temporary dental crowns until the lab sends back their permanent restorations, either. When you leave Premier Family Dental, your whole dental procedure will be complete. What are CEREC dental crowns created of? 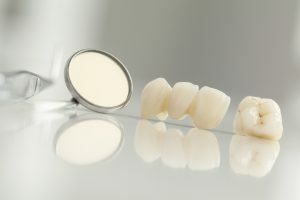 Instead of using metal materials that some patients can even be allergic to, all of our CEREC dental crowns are created with a tooth-colored porcelain material that’ biocompatible and plaque-resistant. You don’t have to worry about your dental restoration sticking out from the rest of your smile like a sore thumb. Your dental crown will be camouflaged amongst your natural teeth! How long do CEREC dental crowns last? CEREC in Waco can last at least 10 to 15 years with the proper care. Patients have reported that they’ve lost over 30 years! It’s important to protect your crowns from excessive teeth clenching, grinding, and eventually cracking. Patients who routinely grind or clench their teeth may find that they’re restorations don’t last as long without a custom mouthguard. You just had a root canal. You cracked or broke a tooth. You have severe tooth decay. You need a large filling. You just had a dental implant installed. A dental bridge needs to be supported. How can I get my CEREC dental crown? Don’t put off regaining a whole, healthy, and functional smile too much longer! Contact our Waco dental office today to receive the care you need in a quick, convenient way. If you have any questions about CEREC technology, schedule a consultation with Dr. Cofer.